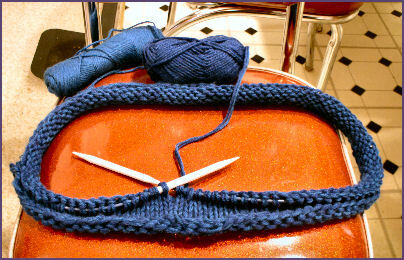 Ok, so I’m knitting again, at least taking baby steps in the right direction. I promised my cousin Diane a felted brimmed hat like this one: Genny’s Hat. Diane has requested a teal hat, so I’m combining two strands of KnitPicks Wool of the Andes, combining one strand of the color “Stream” and one strand of “Winter Night”. It’s making a lovely deep teal. At first I was concerned that the color wouldn’t be right at all, but now I’m loving it! Let’s hope that Diane does, too. It feels good to be kniting again.